A brilliant and rewarding combat system propels a story that never becomes as interesting as it seemingly should. Transistor begins with a woman, a dead body, a talking sword, and a dying city. Red is a singer with no voice, trapped in a sprawling digital metropolis being erased by white robot programs called the Process. Byte by byte, block by block, Cloudbank is becoming nothingness in the shape of a city. But Red has the Transistor, the mysterious sword she pulled out of the dead body at her feet. Red is the hero, but the Transistor plays both narrator and star. Eight hours after grasping that sword, I reached the end of Red's journey in love with the Transistor's deeply nuanced combat abilities—and disappointed that the world around her felt so shallow by comparison. Like Bastion , Supergiant's first game, Transistor is an action RPG set in a dying world, with a narrator keeping you company as you play. The narration works just as well as it did in Bastion (and comes from the same voice actor), lending emotion to a stoic silent protagonist and offering insight and context about the world. The narrator also does most of the expository heavy lifting, musing about the Camerata, the shadowy organization behind the destructive Process. As he talks, Red walks through linear environments, stopping every couple minutes for a battle that will be over in two or three minutes. Supergiant leans more heavily on the RPG half of its formula than it did with Bastion, as the Transistor can freeze time and initiate a planning mode called Turn() for queuing abilities called functions—digital souls absorbed by the Transistor—against the Process. Walking around the map and queuing abilities fill up an action bar, and more powerful abilities eat up more space on the bar. Positioning and planning the order of attacks is vital. Most abilities can hit multiple enemies when aimed by holding down a button and choosing an angle of attack. Crucially, any ability—even one that would normally eat up half the action bar—can close out the turn queue, even if the bar is nearly full. I learned to save my heaviest hits for last. After committing to a sequence of attacks, the world snaps back into action and enemies move in slow-mo as Red attacks in real time. There's a great cadence to combat. I'll sometimes spend a full minute planning the most efficient turn, then watch Red execute four Process in as many seconds. The reward for mastery is a quick, satisfying victory. Transistor's hybrid of real-time and turn-based combat is infinitely malleable thanks to the sword's functions. All 16 functions can be used as active abilities—stuns, ranged line attacks, explosive AOEs, cloaking fields, dodges—or as upgrades that augment the effects of other functions. Early in the game, I upgraded the slow-but-powerful Breach function with Jaunt, which made the attack trigger instantly and let me use it while my meter was recharging. Later I built my kit around Red's first function, Crash, which makes enemies vulnerable, and Cull, a devastatingly powerful knock-up attack that costs a huge chunk of the turn meter. But that didn't matter, since I could take down even the toughest Process in one turn. As if there weren't enough active and upgrade combinations, all 16 functions have another effect when equipped in a passive slot. As an active function, Help summons an AI companion to assist in battle. Equip it as a passive, and it offers a 25% chance to become a SuperUser when triggering a turn, which grants unlimited movement range and a devastating one-hit-kill attack. Purge, a damage-over-time active, becomes an automatic counterattack equipped as a passive. My favorite passive is Bounce, which gave Red a lifesaving damage shield. But there's a trade-off: Bounce is also a great attack, as its bullets ricochet from enemy to enemy. Transistor is built to be played with a controller, as each function is mapped to a face button and Turn() is controlled with the triggers. The default mouse/keyboard controls are a little clunky—pressing 1-4 will highlight a function, and right mouse button triggers it—but an alternate option will fire off the function instead of highlighting it. The keys can also be remapped, and Transistor has the most impressive on-the-fly UI switching I've ever seen for controls. Touch the keyboard or mouse, and all the in-game UI elements will show PC controls. Touch the controller, and they'll automatically switch to controller prompts. It's one of those little touches that's so slick, you wonder why it's not in every game. There are thousands of combinations that can fill those four active slots, and the system opens up even more in Transistor's New Game+ mode. I kept playing after completing the story to get more of the combat. Combining functions is strategically rewarding, and there's a fun, exciting tension in triggering a turn and then dodging the remaining Process as it recharges. Combat is on the easy side, though—I only died twice throughout the game, and I played at least half of it with a combination of "limiters" equipped. It's one of those little touches that's so slick, you wonder why it's not in every game. Limiters unlock throughout the game and make the Process spawn in greater numbers or hit harder or gain protective shields. Fighting with limiters engaged earns Red more experience. I could've made Transistor even tougher, but I enjoyed the balance I found with three out of 10 limiters equipped. I never want to use the limiter that reduces my memory pool, for example, because then I couldn't have as much fun combining functions. With three limiters engaged, I did bottom out my health bar in some of Transistor's more intense fights. But that's not a death sentence—it overloads and disables an active function, restores your health, and lets you fight on. This led to some of my favorite battles, as I suddenly had to figure out how to finish off the Process with my go-to damage abilities disabled. I finished one battle with a single active function left. When they're all gone, it's lights out. While Transistor's combat only gets more fun in New Game+, I also rolled into a second playthrough with the forlorn hope that there was more to Transistor's story than I'd gotten the first time around. Unfortunately, there wasn't. The city of Cloudbank is stunning, a lusciously detailed, hand-drawn cyberpunk future built atop the memory of a red-gold art deco past. As the Process consume it, streets awash in vivid green and red and purple lighting fade to austere white. Cloundbank's end state will be like the Construct in The Matrix: endless nothing, ready to be overwritten. At 1080p and 1440p I never saw Transistor's framerate dip from a smooth 60 fps. It was rock solid while exploring or fighting a dozen Process at once, even with neon particle effects overwhelming the screen. The framerate did struggle at 4320x2560 on the Large Pixel Collider, a resolution it clearly wasn't optimized for. Though the game was designed for 1080p, it looked great at 4K and at 1440p. Zooming in on 4K screenshots, I can see the signs of upscaled 2D art, but from normal sitting distance the game was unfailingly beautiful. Exploring the empty streets of Cloudbank had me as entranced as the first time I stepped foot into Bioshock's Rapture. Supergiant's 2D art is that compelling, and the city's blend of sci-fi and classic architecture promises a fascinating backstory. I was still waiting for that backstory when the game ended. There's this feeling I get when I'm dropped into a new fictional world like Transistor's in media res . It starts as an inkling of excitement. This imaginary world was established long before I got here. Events have been set in motion, and I'm playing catchup. What makes this world tick? How long has it been here? I want to know. I start playing like an archaeologist, scouring the corners of a game world to find out more about this place and its characters. I start reading more closely, paying attention to character bios and posters and signs to piece the world together. I get more excited as I approach the payoff—that moment when the worldbuilding clicks, when I come across the charred remains of the poor soul whose audio diaries I've been listening to in Bioshock , or read a passage of William Gibson's cyberpunk novel Neuromancer so evocative that I can see cyberspace clearly in my mind. This is the moment when I'm completely absorbed, and I know this world is complex and vital and alive beyond the narrow pathway of the specific story it has to tell. Transistor never has that payoff. I thought the narrator's cryptic references to Cloudbank's past were building up to a moment that would do the city justice, but that moment just never comes. I hoped that I would encounter the people of Cloudbank and learn their stories, but after battling the Process from empty environment to empty environment, that hope shrank. I hoped sidequests or puzzles would feed me clues, but only a handful of terminals around Cloudbank offer cursory insight into the city's culture. Like Bastion, Transistor is focused on a hero and a narrator traversing the ruins of their world. But Bastion had a hub point to return to where more characters eventually gathered. As the mystery of Bastion unfolded, it tied the fates of its characters to the fate of its world. It was that world's epilogue. Red's story, by contrast, feels like a sliver of what is interesting and compelling about the city of Cloudbank. Transistor is disappointingly linear in a city that begs for exploration. 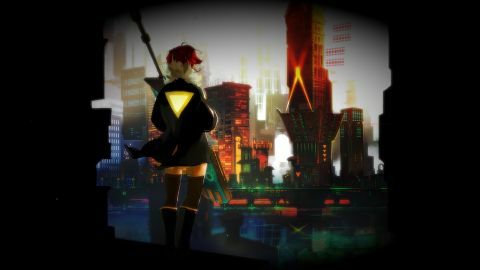 The story Transistor does tell is dished out in tantalizing morsels, and I had to spend some time reflecting on the ending to decide what happened. Perhaps because of that vagueness, Transistor's emotional climax didn't hit me like Bastion's did. Supergiant's games are, in that sense, mirror images—the first with shallower combat but a powerfully told story, the second with deep, tactical battles but a story that doesn't fulfill the promise of its world. Then again, that promise lives on even after the credits roll. I hope Supergiant isn't done with the world of Transistor, because there's so much more I want to know.